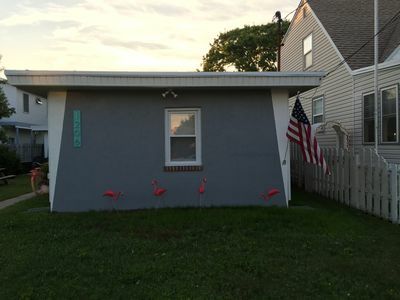 North Wildwood, NJ - Quiet Residential Area. 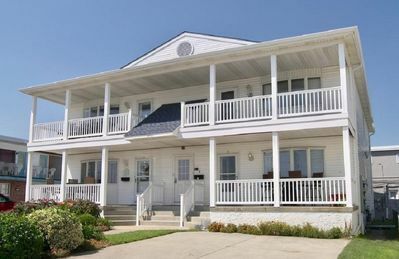 1 Block to Beach and Boardwalk! 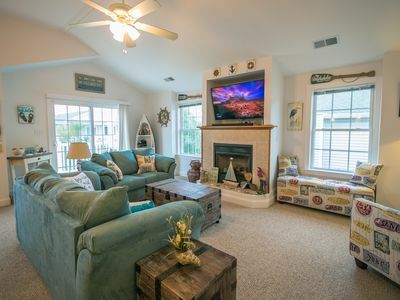 - Cottage-Style Furnishings with Tropical Decor: Very Attractively Decorated. Attention to Detail. 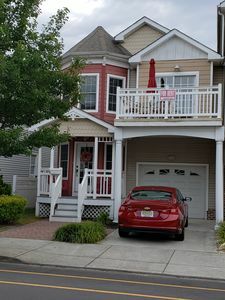 *Large Kitchen: Granite Countertops, Counter with 5 stools, Pantry, Stainless Appliances, Plenty of Cabinet Space, Center Island. 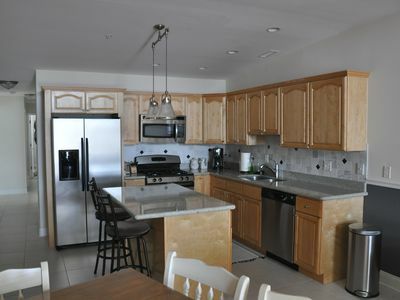 -Kitchen is Fully-Equipped with coffee maker, microwave, toaster oven, dishes, utensils, pots & pans, etc. *Living Room: Spacious with lots of Light. -pull out Sofa. Flat Screen TV & DVD. 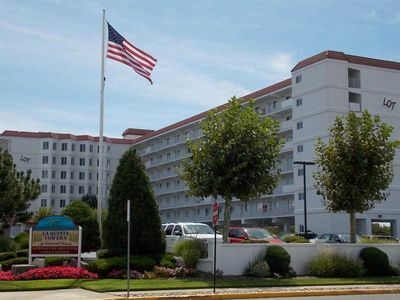 *Two Large Master Bedrooms: Each with their own Private full Baths, both have Queen size beds. -One Master bedroom has walk-in-closet, the other a large closet with double doors. TV in each Bedroom. 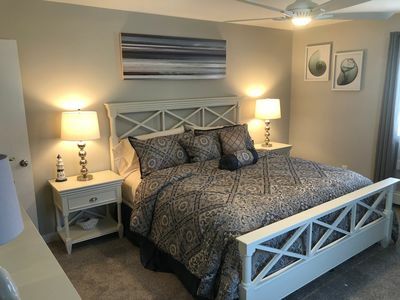 *Third Bedroom: Twin beds with walk-in-closet. TV. *Fourth Bedroom: is SUITE STYLE (on ground floor) with Private full Bath, Queen-size bed, Sitting Area, Mini Fridge & TV. 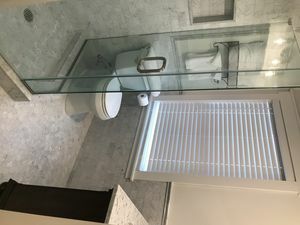 -This Room is located on entrance level, separate entrance, a nice feature for added privacy. 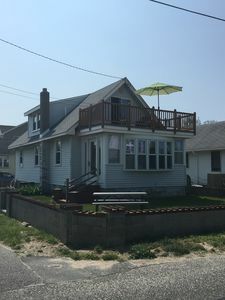 *Private Deck: Off Living Room & Bedroom. Table & Chairs - Seats 6. Chaise Lounges. *Garage: (Private) Parking for 2 Cars, Additional Driveway Parking for an Additional Car. 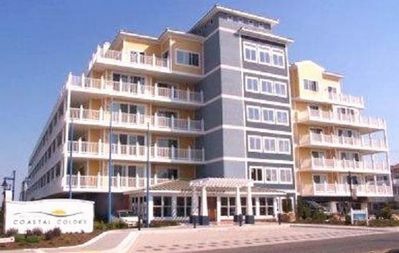 *Entrance: Foyer, Interior Stairwell to your unit, and one other. *Backyard: Large with Picnic Tables. 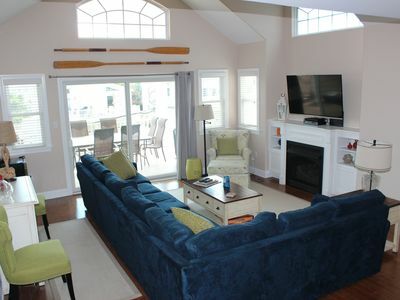 -area carpets in Living Room & Dining Room. *Tile flooring in kitchen and bathrooms. 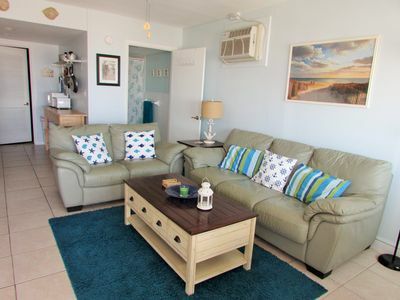 *Property is Nicely & Brightly Furnished. *Rooms are Large and Spacious. 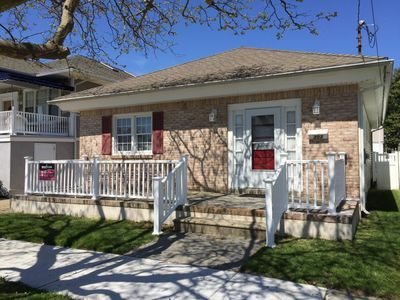 *Property is Beautifully Landscaped & Hardscaped. 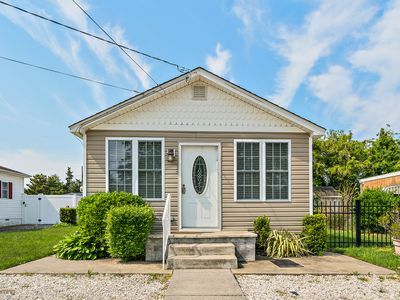 *Located only 1 block from Beach and Boardwalk @ 17th & Surf, North Wildwood. At the beginning of boardwalk on North-end. Complimentary POOL Privileges at Motel across Street. **Guests need to bring their own linens: bed sheets and towels. 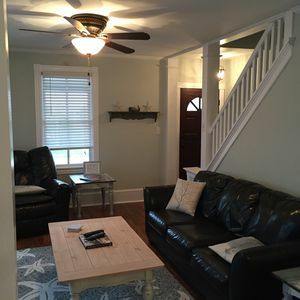 However, we provide contact info for all type rentals including sheets, towels, high chairs, pack and play and beach gear from local services that provide these items. 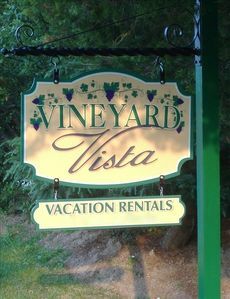 Our tenants are eligible for 20% discount. 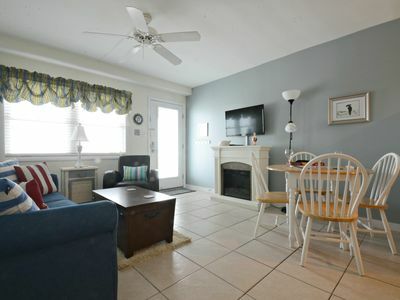 Beautiful 3BR/2BA Beach Block Condo! 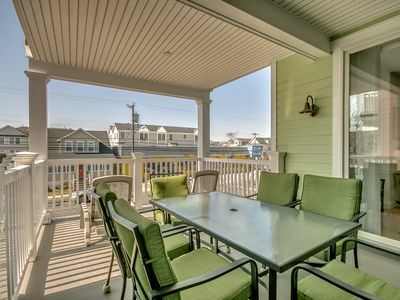 Great for families or large groups with pool and just 3 blocks to the beach! 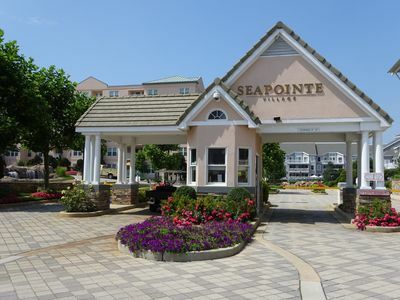 Seapointe Village Diamond Beach NJ - First floor, lobby level location. 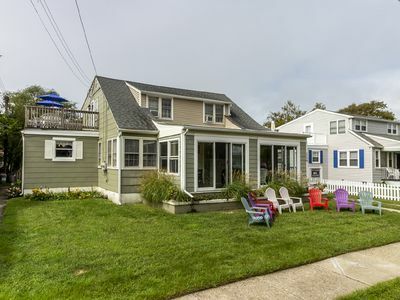 Seaside cottage, one Block to Beach! private roof deck! 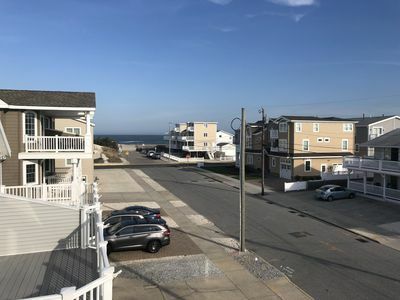 Beautiful OCEAN VIEW Beach Block Townhouse - only five houses off beach !